The buoyant mood at Bistro Rousseau deflates when Chef Camille's sister, Renee, turns up dead in the chef's kitchen, and Mimi Rousseau must tease the real killer out of a m lange of menacing characters. Crush Week in Nouvelle Vie is a madhouse--in a good way. Tourists pour into town for the pressing of the Napa Valley's world-renowned grapes and all the town's businesses get a nice lift, including Bistro and Maison Rousseau. Mimi is raising the ante this year with a Sweet Treats Festival, a wonderland of croissants, cakes, tarts, and souffl's crafted with expert care by the area's top talents. Chef Camille's sister Renee is managing the festival with a cast-iron fist, upsetting everyone, including her sister. Which is bad for Camille when Renee turns up dead in the chef's kitchen. Mimi is still building her business, so her first course of action is to whip up answers and catch the unsavory perpetrator before Camille takes a dusting and gets burned. 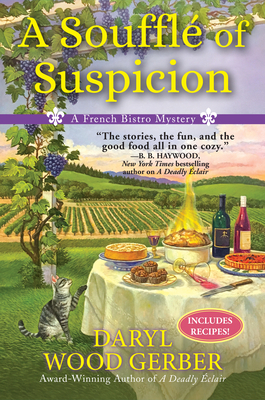 Fans of JoAnna Carl and Joanne Fluke will want a succulent second serving of A Souffl of Suspicion, Daryl Wood Gerber's appetizing second French Bistro mystery. Agatha Award-winning author Daryl Wood Gerber writes the Cookbook Nook mysteries, and as Avery Aames, she pens the Cheese Shop mysteries. As an actress, Daryl appeared in Murder, She Wrote. She has also jumped out of a perfectly good airplane and hitchhiked around Ireland by herself. She loves to read and cook, and she has a frisky Goldendoodle named Sparky. This is her second French Bistro mystery.